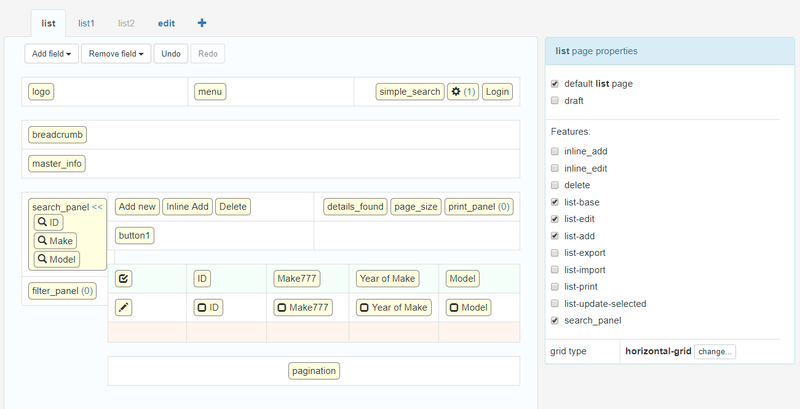 Normally tab order is determined by the web browser based on your Add/Edit page structure. 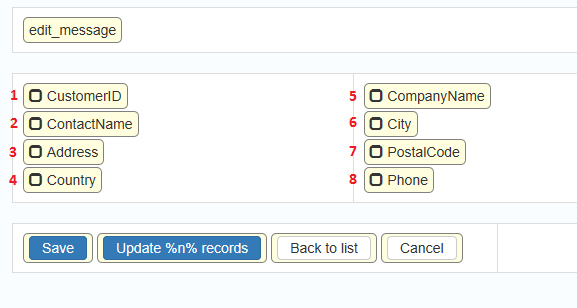 If you have a single row two-column form browser will tab through first cell edit controls first before switching to second cell. If you purchased or upgraded PHPRunner, or ASPRunner.NET less than one year ago logon to control panel at https://xlinesoft.com/dss/support.asp and find download links and registration keys under 'My purchases'. There should be 'Reg info' link next to your latest upgrade purchase. Note: Software maintenance coverage needs to be continuous. If your last purchase or upgrade were more than one year ago you have till February 28, 2019 to renew your maintenance. After that date you will have to purchase PHPRunner, ASPRunner.NET or ASPRunnerPro at the full price. PHPRunner 10 and ASPRunner.NET 10 are here! The wait is over. PHPRunner 10 and ASPRunner.NET 10 are here! If you purchased or upgraded PHPRunner, ASPRunnerPro or ASPRunner.NET less than one year ago logon to control panel at https://xlinesoft.com/dss/support.asp and find download links and registration keys under 'My purchases'. There should be 'Reg info' link next to your latest upgrade purchase. Note: Software maintenance coverage needs to be continuous. If your last purchase or upgrade were more than one year ago you have till July 31, 2018 to renew your maintenance. After that date you will have to purchase PHPRunner, ASPRunner.NET or ASPRunnerPro at the full price. It is about time we talk about version 10 of PHPRunner, ASPRunner.NET and ASPRunnerPro. 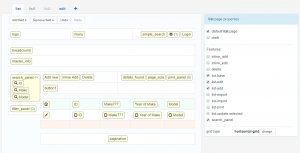 We expect beta version to be available in November and stable version will be released before the end of the year. Make sure that your software maintenance is current. Otherwise you will have to purchase version 10 at the full price. 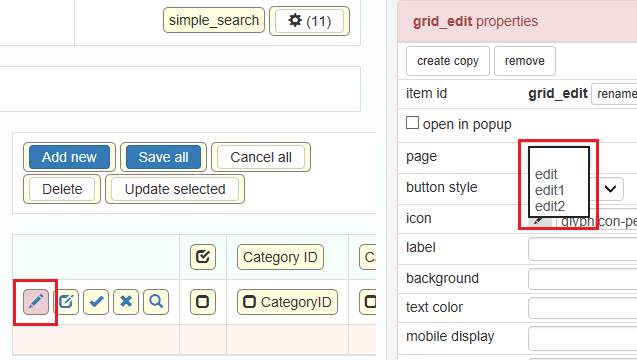 The most interesting new feature in this update is Page Designer which will complement and eventually will replace the Visual Editor. This is quite a big change and before we talk about new functionality I need to explain why this change was required. PHPRunner 9.8, ASPRunnerPro 9.8 and ASPRunner.NET 9.8 is here! 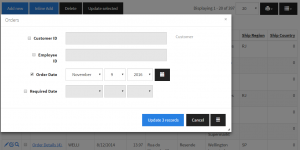 If you purchased or upgraded PHPRunner, ASPRunnerPro or ASPRunner.NET less than one year ago logon to control panel at https://xlinesoft.com/dss/support.asp and find download links and registration keys under ‘My purchases’. There should be ‘Reg info’ link next to your latest upgrade purchase. New customer purchase . . . → Read More: PHPRunner 9.8, ASPRunnerPro 9.8 and ASPRunner.NET 9.8 is here! PHPRunner 9.7, ASPRunnerPro 9.7 and ASPRunner.NET 9.7 released! Here is the list of new features in version 9.7. 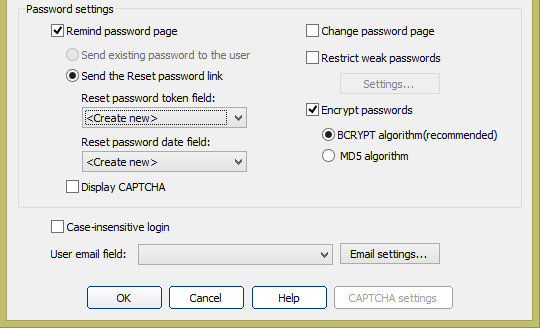 Option to use industry standard bcrypt hashing algorithm. Send password reset link to user's email, link expires in 24 hours. PHPRunner 9.6, ASPRunnerPro 9.6, ASPRunner.NET 9.6 released (November 10th, 2016). If you purchased or upgraded PHPRunner, ASPRunner.NET or ASPRunnerPro after November 10, 2015 this update is free of charge for you. 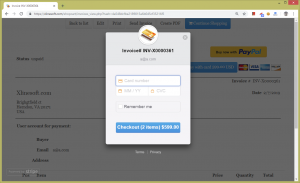 Logon to control panel at https://xlinesoft.com/dss/support.asp and find download links and registration keys under 'My purchases'. If you do not have a help desk account yet create a new one using the same email address you have used to place the order. Important: if you purchased PHPRunner, ASPRunnerPro or ASPRunner.NET before November 10th 2015 you have till November 20th, 2016 to use discounted upgrade option. After November 20th, 2016 you will have to purchase software at the full price. Do not miss your chance to upgrade for less. 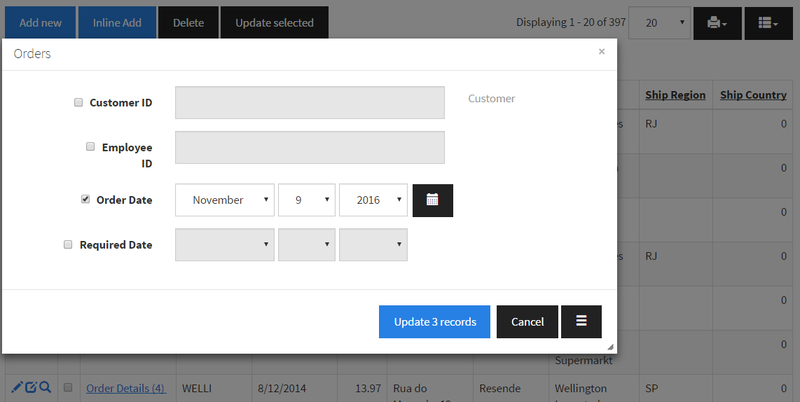 This is a long awaited feature that allows you quickly makes changes to multiple records. You can choose fields to appear on 'Update selected' dialog. Depending on Edit page settings 'Update selected' page can be shown either in popup or as a separate page.